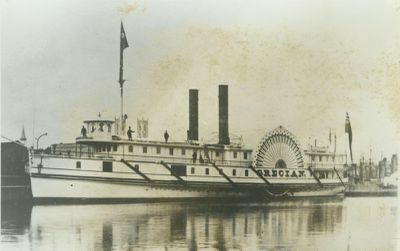 Canadian Inland Steam Navigation Company, Montreal, QUE. 45 x 120" engines, Eagle Foundry, Montreal. Wrecked when steering gear failed; one killed. 1869, Sep Attempts to refloat failed. 1864, Jun 2 Registered Montreal. 1867, Jul 5 Stranded Lachine Rapids. 1868 Inspected Kingston, ONT, 422 gross tons. 1868, Jul 16 Stranded Cascades Rapids. 1868, Oct 30 Stranded Galops Rapids.